Elvis Presley: Christmas With Elvis And The Royal Philharmonic Orchestra' brings together Elvis Presley's best-loved performances from 'Elvis' Christmas Album' (1957) and 'Elvis Sings The Wonderful World Of Christmas' (1971) re-imagined with sublime and exquisite new arrangements performed by The Royal Philharmonic Orchestra. 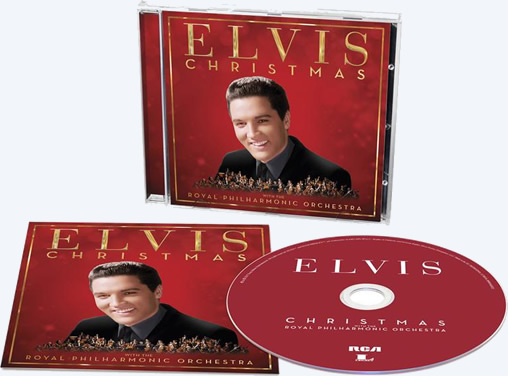 'Elvis Presley: Christmas With Elvis And The Royal Philharmonic Orchestra' will be released on CD, LP, on Friday, October 6th. A deluxe version of the album contains 4 bonus tracks (new symphonic versions of material from Elvis' 'Peace In The Valley' EP) and will be released on CD, on Friday, November 24.